It’s just hours now until Lost kicks off its 2009 season—hopefully you have some suitable Lost-themed festivities planned for the event. 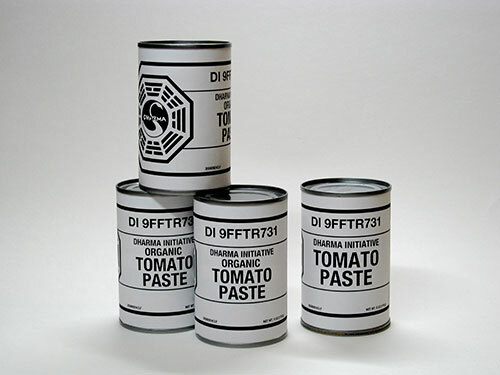 But, even if you’re not hosting a star-studded Hollywood bash or a fanboy-encrusted living room viewing party, there’s no reason not to enjoy a quiet, DHARMA Initiative-supplied dinner during the 3-hour Season 5 premiere. The tomato paste, available in organic and, uh, inorganic, varieties should be arriving in supply drops any day now. If you need a couple of cans for your evening’s gala event, though, you might want to make up a couple of cans using the downloadable labels above. Now where did I put the DHARMA Initiative marinara sauce recipe? This entry was posted on Wednesday, January 21st, 2009 at 2:58 pm	and is filed under Film/Video, Food, Graphic Design. You can follow any responses to this entry through the RSS 2.0 feed. Responses are currently closed, but you can trackback from your own site.